Palacio Barolo is one of our favorite spots in the city, and now, there is finally a great new restaurant right around the corner to lunch or dine in after visiting the beautiful historical landmark. The restaurant, which opened in May, is a little bistro with a unique art deco setting that was designed by one of the four owners, Julián Benedit, who is also an artist. Portions are generous, and the menu features auteur dishes (by another owner, Sebastián Vollert) such pan fried prawns and lamb burgers. There is also a bright and colorful bar to either stop for a drink or grab a bite. Just what the area needed! El Perlado opens from Monday to Saturday from midday to 4pm and from 8pm to closing. Hipólito Yrigoyen 1386, Congreso. 4382-8689. A treasure cove of mischief and distorted fantasies, the basement of the Pasaje Guemes, with its cabaret, theatre and restaurant, has charmed its eclectic public during the 1920’s throught the 50’s. So much so, that Antoine de Saint Exupery became a regular during his year in Argentina and author Julio Cortazar situated his story ‘The Other Sky’ in the art-deco gallery. 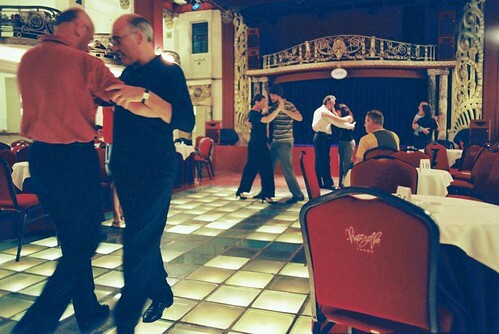 Now a days The Piazzolla Tango Centro de Arte offers the chance to visit the beautiful interior of the cabaret, theatre and restaurant whist serving dinner and staging tango shows. If you’re looking for great architecture, history, tango and all with a touch of literary allure (in other words everything good about Buenos Aires! ), you will surely find it all in this spectactular tango venue!